Pleaching = (Hedging with a small trunk – like this picture) Pleached Standard Ficus is a hot item this season, with customers doing some really cool designs and landscaping with their pleached hedges. 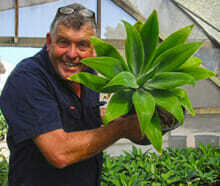 The secret with pleaching is that ficus are evergreen and pleach very easily. 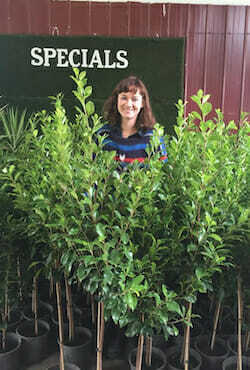 These particular ficus are the Emerald Green Ficus Flash Hilii and are very lush and are fantastic for doing a pleached hedge. 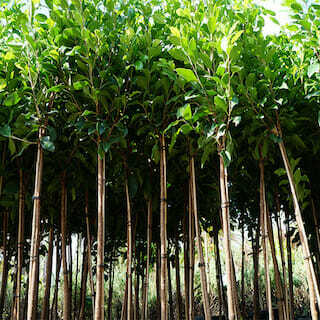 Also as Ficus have been renowned for growing an aggressive root system, the pleaching effect actually keeps the roots under control and allows for you to grow these Ficus in very confined spaces and gardens. These days with the rapid growth of our cities, lots of people are having smaller and smaller gardens! The beauty of the pleach hedge is it is very good for small gardens as you can do 2, or even sometimes a 3 layer effect. 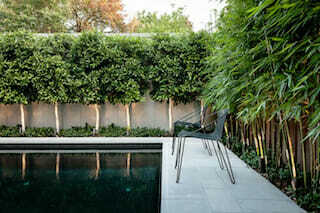 It allows for a garden bed underneath the hedge, maximising your gardens beauty, colour and depth. It’s like having a 2 or 3 story garden as you really get the 2 story effect which is becoming more and more stylish in the modern garden. Pleaching creates another dimension to your garden! 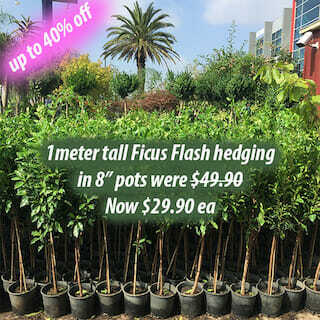 Make the best use of your confined space this summer and come and check out our Pleached Standard Ficus for only $29.90 each in an 8” pot, thats up to 40% off the regular price in our 80% off plant clearance sale this weekend. They are ranging from 3-4ft tall in height and pleaching from 1-2ft tall.